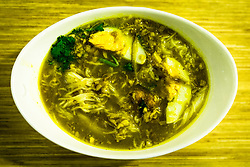 Mohinga is a rice noodle and fish soup from Myanmar and is an essential part of Burmese cuisine. It is considered by many to be the national dish of Myanmar. Lahpet is Burmese for fermented or pickled tea. Burma is one of very few countries where tea is eaten as well as drunk. Its pickled tea is unique in the region, and is not only regarded as the national delicacy but plays a significant role in Burmese society. Laphet is most commonly encountered in tea leaf salad. Lephet Thoke - Tea Leaf Salad with dried shrimp, peanuts, garlic and sesame seeds. 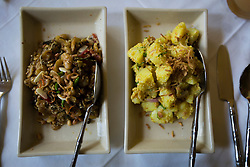 Arloo Thoke - Myanmar potato salad.